Nice Media created a campaign video for Brighton-based charity The Clock Tower Sanctuary, to help secure over £20k in funding for homeless young people in and around the city. GamesAid, a national games industry-led organisation, raises awareness of UK charities that support disabled and disadvantaged youth/children. The Clock Tower Sanctuary participated in GamesAid’s annual initiative that secures charitable donations as voted for by video game professionals. On World Polio Day, October 24th, Nice Media attended the opening of a new polio vaccine plant at GSK, Wavre, Belgium, where their 30-minute documentary The Endgame, was premiered. The new 340 million Euro plant at Wavre has been built to service the endgame – the last, difficult push to eliminate polio from the planet, with superstition, war and vaccine resistance obstacles along the path. Nice Media’s documentary, The Endgame has been funded by GSK and commissioned by Pearl Group. The documentary’s title reflects the final thrust to eradicate this infectious disease. Brighton-based video agency Nice Media launches their exclusive Video Toolkit ahead of Learning Technologies 2018. Over the last year, the agency has seen a rise in clients asking for internal workshops that offer solutions to their L&D challenges; solutions using video. The internal workshops are proving very successful for clients owing to Nice Media’s collaborative and consultative approach in hosting the sessions. Everyone loves a pub quiz, right? Every flavour of crisps in the middle of the table, multiple pencils and a quirky team name. If there was a round on video we would ace it; we’d play our Joker card. If there was a round on video for learning, well, everyone else might as well go home. Why do we need Real Drama for Learning? Whenever you see a video with more than one actor in it you expect it to be a drama. When it isn’t you are disappointed. This is what prompted us to launch our Real Drama for Learning initiative. So often we have seen, so often we have made little films with actors in which they act out workplace scenes, but these scenes have no dramatic structure. It doesn’t matter how well they are filmed and acted they are never going to grab you. If the scenarios and scripts were created by dramatists the videos would cost the same to film and edit, but the results would be a lot more engaging. But is drama really appropriate in a learning video? We’re not making entertainment. Drama is the technique of telling a story with actors. When we tell a story we give meaning to impersonal facts. The meaning makes the facts sticky to our memories. A story ends with a moral that ties up all the meaning into one little package. It’s the punchline that says “I told you so”: The boy who cried wolf is eaten; the Terminator gives his life to save John Connor, Rick gives up Ilsa and goes off to fight the Nazis. These are glamourous and fantastic examples, but any human activity no matter how everyday can be food for drama, it only need be interesting enough for there to be more than one opinion about it. Nice Media has set out to create a conceptual toolkit, distillations of classic technique to help learning designers to design and write drama. Subjects include – how to design characters, character functions, protagonist and antagonist, how to turn learning points into plot points, how to handle exposition and story structure. It may take a lifetime to become a dramatist, but with moderate effort anyone can learn the basics of dramatic storytelling. To make it clear what we’re going on about here’s an example. How might we dramatize the management of sickness absence? Start at the extremes to leverage emotion. One extreme is Brian – an employee who shows no signs of illness, but is chronically off sick. This immediately suggests two potential extreme reactions – over-empathy and total lack of empathy. One character thinks the absentee is a lazy rotter and the other really feels his pain. Make these two people the business owner, Theresa, and the HR manager, Lucy. Theresa and Lucy are the antagonist and protagonist, (with Brian Lucy’s sidekick). They both want the same thing, to get Brian back to work, but disagree on how it should be achieved. Now, at the passing of every procedural step, Lucy clashes with Theresa and Brian’s feelings are bounced around in front of us. In each clash we traverse the attitudes, concerns and delicacies of what is going on as the issues are tackled in this conflictual structure. The issues are alive with emotion. After the screws of procedural pressure are turned up to the max on Brian, he blurts out that he can’t come back to work because, as a gay man he feels discriminated against. It turns out that Theresa has allowed the development of an intolerant company culture. The revelation saves the company and gets Brian back to work and productive. The sexual identity bit of the story could be anything else that the company needs to know about itself that could cause a prolonged absence such as childcare issues, bullying or a bad manager. This happy ending provides the “story proof” and the moral that the procedures, while difficult for all, are the best way to ensure a good outcome. This is the first in a series of articles and videos in which we will share our conceptual toolkit and help you and your team to write better drama. If you have a set of learning points you’d like to dramatize send them to us as a challenge and we’ll see what we can do. Three years after it was made the interactive video Will You Fit Into Deloitte is still regularly cited as an exemplar for corporate video makers. In this article, I will discuss the mechanisms this excellent video uses and explain how they work with reference to the common functions and devices of recruitment videos. If you’ve not seen the video yet, I suggest you have a quick look now. Before I start, it’s worth noting that there is a continuum between the recruitment and onboarding function. After all, if candidates start the onboarding process when applying you can get them up and running faster if they become employees. The high-level messaging of a recruitment campaign is usually to educate candidates around what it’s like to work at your organisation and why your organisation is a great place to work. You can also keep candidates warm for when your organisation has an opportunity that is a good fit. Video is just one element of a recruitment campaign. The greatest strength of video is its ability to communicate a high-level message quickly, with emotional clout and a good level of engagement. In this context, what would we generally call upon video to do in a recruitment campaign? Video is a great tool for showing the workplace. A candidate can see and hear their future colleagues and get a believable account of what a workplace is like. A high proportion of recruitment videos feature interviews with a cross-section of the workforce giving informal insights into what it’s like to work here, or discussing the company values and how they work for them. By this means a video can combine 2 types of messaging – a display of the lovely workplace and colleagues, combined with an insight into the culture and values. The Deloitte video takes this idea and gives it a twist. We see the Deloitte workforce, but they are acting. Better than that, they are play acting. They are playing with you as the interactive viewer. Their play acting is an exemplar of how they cooperate at work. You are literally watching them work, and it’s playful. They’re not taking themselves too seriously. The people on screen are collaborating to put across the company message. Deep stuff. The video also takes you outside the workplace into the hills, exercising with your colleagues. It shows the hinterland and physical setting of the work experience. Video is a good tool to motivate people to work for you and to discourage people who won’t be suitable. This is about brand values and your mission. Sometimes a brand message is articulated with interviews with the founder or CEO. This person can take the company mission and make it personal. There’s also an extra level of subtext – it’s my baby, it all rests on my shoulders, don’t join if you don’t buy in to it. This also functions to deter the unsuitable. In the Deloitte video where is the authoritative brand message? It’s there, but it’s hidden. It’s woven into the fabric of the film. Although the film is light-hearted, it’s a test of values. Will you fit in? It’s a challenge and you must rise to it. And because of the interactions you are reminded of this again and again. 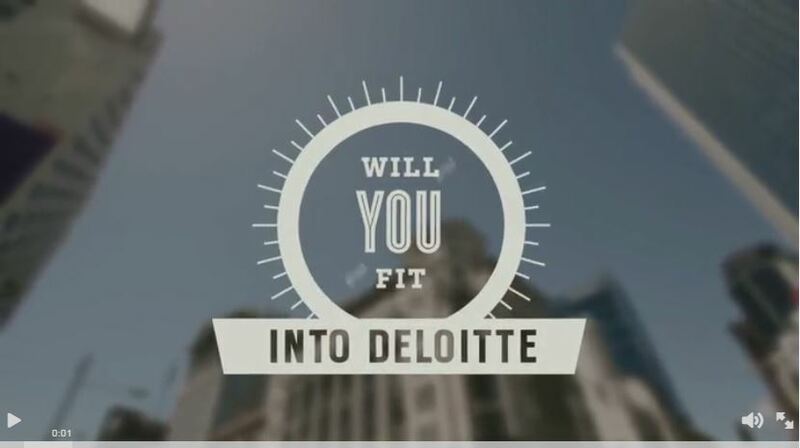 Will You Fit Into Deloitte is a great video. It’s filmed and edited with great skill, but this isn’t what makes it good. It’s well scripted, but even this isn’t the key to its excellence. It has good visual design, but this is also a commonplace. What’s rare about the piece is the high-level design. A conception that seamlessly integrates all the main functions of a recruitment video into an enjoyable confection. It’s a design that articulates serious issues with a humorous touch. A design that uses drama – depicting conflict without fear. A design that enables Deloitte staff to collude with the filmmakers and viewers, to perform and to come out looking good. It’s a great synergistic bit of thinking. What about the function of the literal point of view that the camera takes? What’s going on here, why does it work and would it work in other contexts? It might seem an obvious way to film this subject matter. You are imagining being the new starter, so let’s film it “through your eyes”. This is a good starting point for using the method, but we should not overlook the associated effects of this device. Literal point of view makes the viewer aware they are watching a film. It’s not immersive in a dramatic sense, not empathic. The device pushes us back and puts us in the position of a critic. This position is ideal for comedy, because comedy is a form of criticism. And it’s good for learning as well, because a critical position is a thoughtful one. And, of course, this position also works with the gamified structure. These self-aware effects work well with the performances of the Deloitte staff. The filmmakers have set up the staff so their flawed and amateur acting comes across as a knowing and playful collusion with the viewer. If the same content were filmed in a more conventional way we would more easily see the acting as just bad. And this effect works in two directions, the playful performances, looking directly into the lens, make us feel a privileged part of a cool team. We are literally playing with our future colleagues. We want to fit in. Finally, credit must go to the Deloitte team in New Zealand who commissioned this piece. They invested in experienced filmmakers who knew what they are doing and it paid off. They produced something brilliant and achieved unprecedented success with the video going viral. Surely an unexpected and welcome, extra return on their investment. Learning Trends 2017! We were only two days in to the new year and my Twitter feed was already exploding with predictions for the year ahead. Rather than immediately jump on the bandwagon I thought it best to let the dust settle and see if I could make some sense of what remained after the storm. When I was asked exactly what video is good for in learning I couldn’t come up with an instant answer, so here’s a considered one. Undoubtedly video’s greatest strength is in quickly communicating high level understanding of a subject, while giving the content meaning and thereby engaging emotions. A short film to kick off a piece of learning is what I describe as a Battle Speech Video. It’s like the speech before the battle in Henry V – it gives an overview of the battle (the learning ahead) and tells you why it’s important, which in turn engages you emotionally. As a consumer, you might watch a documentary about Egyptology, giving you an overview of the subject and potentially getting you excited about it. If you were inspired enough to take a degree in the subject you’d naturally expect to do some further reading. To be productive colleagues we must control our emotions. But emotions don’t just conveniently do what they are supposed to do. This is when management gets tricky and where video can help. Short drama clips depicting grey area dilemmas are one of the most powerful ways of interesting audiences in such issues. The abstract becomes concrete and our emotions are engaged with these emotional subjects. “What about role plays?” I hear you say. A film of colleagues enacting something they do every day isn’t quite the same as a drama. It’s generally cheaper to produce, but the results are less concise and rarely dramatically (and thus emotionally) convincing. Role plays are strongest when we regard them as what their name implies – not pretending to be real, as drama might be, but films of people sharing a “how to” with their colleagues. As such they bring an extra value of involving and empowering a team. A talking head video gives a message extra clout by virtue of who says it. For an onboarding video, shared experiences of the workplace from your future colleagues can put your mind at rest and help you to hit the ground running. A message that might be met with skepticism can be given greater credibility if it comes from the mouth of a person the listener respects. When you watch the CEO deliver a message you know it’s of paramount importance to the whole organisation. When you want to know how to replace the door seal on a washing machine or how to fix your phone after you dropped it in water many of us go straight to YouTube. Plenty of organisations have used video for a similar function internally. General Electric created a programme of user-generated video to share knowledge about their engineering practices. By filming such content professionally, you can ensure the detail and the communication is 100 per cent clear. A third way is to have video consultants equip and work with your staff to make better videos. Interactivity in video is generally considered to increase the engagement of the learner. A notable 2006 study showed that interactive video was more effective than either linear video or standard eLearning. The main two types of interactivity are hot spots – click on a spot in the video to reveal more information – and branching narratives whereby you choose a path through a story in response to multiple choice questions. And all of this can be linked to scoring. Essentially, all the interactivity we’re familiar with from gaming and eLearning can be brought into a video. The video can become the spine of the learning and can lead you off to articles, quizzes, and web resources. While there can be game elements within an interactive video, it can’t be as interactive or immersive in a gamified way as a video game. This is simply because a video game has so many more interactions per minute. In summary, video is great for high level information, delivered with a punch. It’s great for visual explanations and for discussing emotional subjects. Once you make it interactive, these qualities are combined with the established eLearning methodologies to create more complex and immersive learning. An accommodating and friendly team to work with.